Note: all suggestions/recommendations below come from my own experiences, or those of my friends. I’ve received no compensation of any kind from any of the institutions or companies on this list. As I was creating this guide, I found that someone had submitted one of my Philadelphia posts to reddit, and the commenters – many of them Philly locals – positively skewered it. I’d tried to sugarcoat things, they said – and then they spoke of their miserable neighbors, the drug addicts who accosted them on their daily commute. My takeaway, besides a bruised pride, was this: Philly does not suffer fools or bloggers gladly, even those that have kind things to say about the city. It is not a place for the faint of heart, or the easily offended. Do not approach the city tenderly – jump in with both feet. That, I think, is the only way to see it. And it is worth seeing, in all its gritty, sincere glory – despite what some of the locals say. Forget the impression that you formed of Philadelphia during fifth grade history class: showing an interest in it will not result in you getting picked last for kickball. Probably. It was founded in 1682 by William Penn, which makes it positively ancient by U.S. standards (and charmingly modern by European ones). An important hub during the American Revolution, it served as the nation’s capitol while Washington, D.C. was being built. My longest visit to the Philly happened to coincide with a government shutdown – not an ideal time to visit a city that is teeming with federally-run historical parks. Despite the many shuttered doors, I was still able to get my fill of American history – Benjamin Franklin’s Grave was open, as was the Constitution Center. And though the Liberty Bell Center was closed, I was able to glimpse the infamous national icon through a side window. And while Philadelphia is rich in history, there’s much more to see (in the likely event that fifth grade scarred you that much). It’s home to some of the country’s most unique museums – including the newly-opened (and somewhat controversial) Barnes, to the creepy and jaw-dropping Mutter Museum. Barnes Museum – I feel like the Barnes is an exercise in one man’s ginormous ego. Barnes wanted to create something, and he did – he made enormous collages using the masterpieces of others. That being said (and most editorializing aside), it is one of the single greatest museum collections I’ve ever seen. Just getting a peek at Seurat’s Models (which features A Sunday Afternoon on the Island of Grande Jatte in the friggin background) was worth the admission price alone. Constitution Center – not run by the NPS, so it’s open during a shutdown, this center is full of interactive exhibits that walk you through the creation of one of the most important documents in our country’s history. Plus, you can get a glimpse of tons of artifacts – including Sandra Day O’Conor’s judicial robe, and a candle holder that was used by doctor’s inspecting Lincoln’s fatal wound. Go with a group (it’s ideal for elementary or middle school students) – I went alone and wished I’d had company. 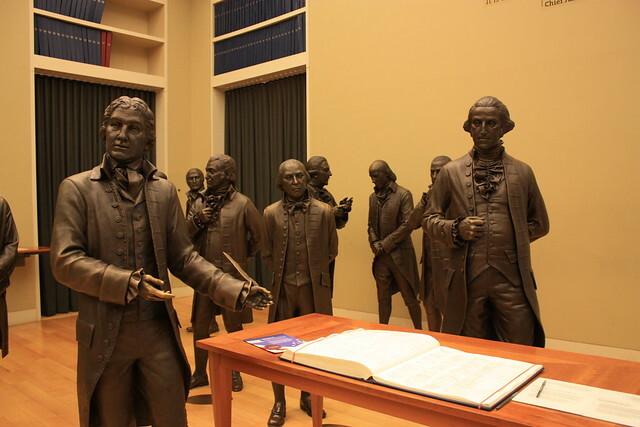 The Signer’s Hall at the Constitution Center. 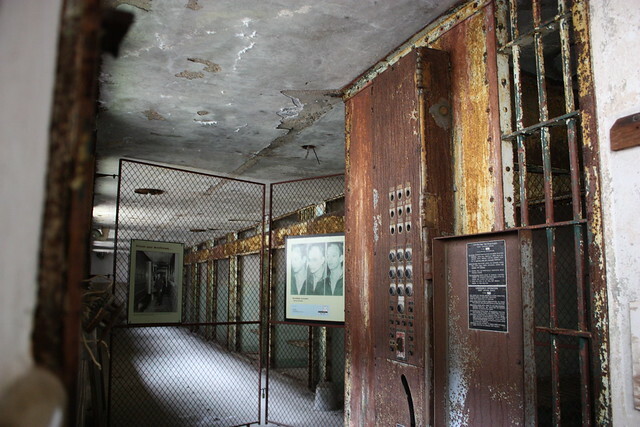 Eastern State Penitentiary – Creepy and wonderful, this old prison is open for tours, and is in a state of “sustained ruin”. Take the audio tour (narrated by Steve Buscemi) or go with a guide. It’s an insightful – and somewhat scary – look at the evolution of our nation’s prisons. I spent an entire morning here, taking tons of photos and getting progressively more and more spooked. Death Row cell block, Eastern State Penitentiary. Franklin’s Grave – not far from many other historical sites, you can easily tie a stop at Benjamin Franklin’s grave in with a visit to the Liberty Bell or the Constitution Center. Be sure to bring some pennies with you to toss on the grave for luck. 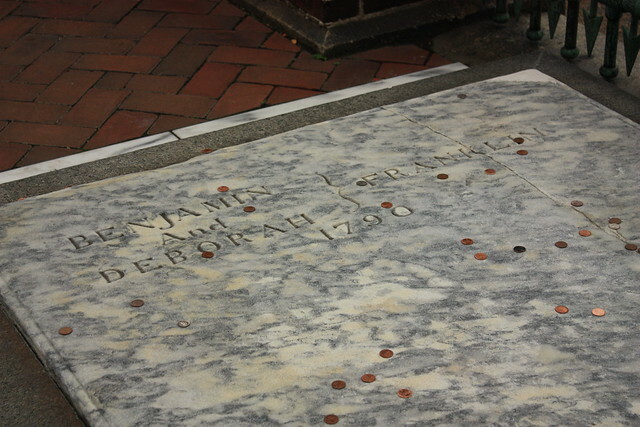 Pennies tossed atop Franklin’s grave. Liberty Bell – Commissioned in 1751, the official bell of the Pennsylvania State House (now Independence Hall), was rung during important announcements. It cracked soon after it arrived from London, and a new bell was cast (using the same metal from the first bell) in 1753. It began to crack again, and has not been rung since 1846 (the cause of either crack remains a mystery). If you don’t want to wait in what can be a very long line, you can get a peek at it from an exterior alcove – but the infamous fissure won’t be visible to you. Mutter Museum – This collection -part of the Philadelphia College of Physicians – is creepy and a little hard to stomach (also? There are stomachs.) Much of the specimens were used as teaching tools during Victorian times – conjoined twins in jars, mummified limbs, and a menagerie of preserved organs, as well as plenty of skeletons and wax replicas, too. I felt it nearly bordered on the exploitative, but if you focus on the importance these objects had in history, you’ll see the museum a little differently (and feel far less disturbed). Philadelphia Museum of Art– A beautiful building with some amazing pieces in their permanent collection – I spent a rainy afternoon getting happily lost here. 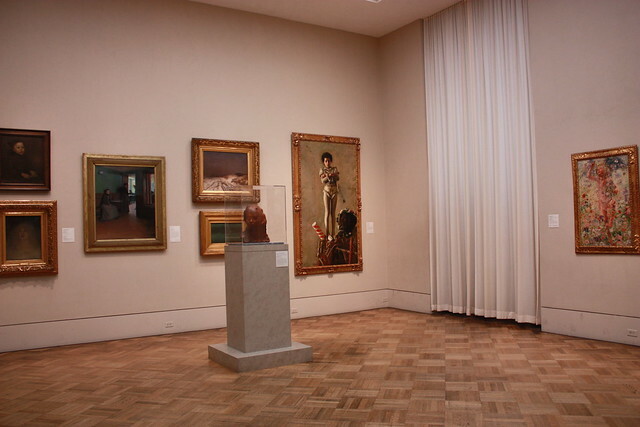 Among my favorites: Renoir’s The Large Bathers and Thomas Eakin’s Between Rounds. There’s also an impressive collection of Degas. 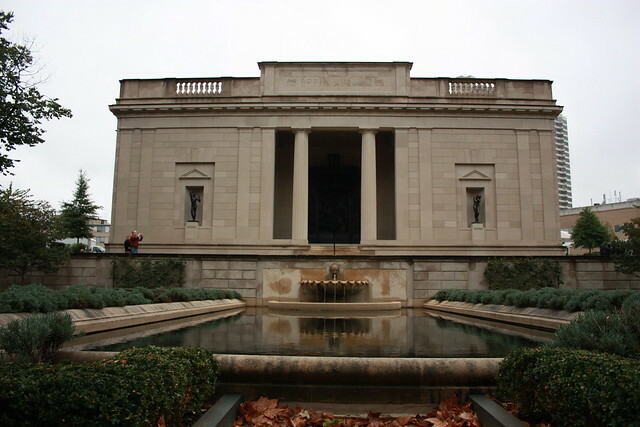 Plus, your admission will get you into the Rodin Museum as well. 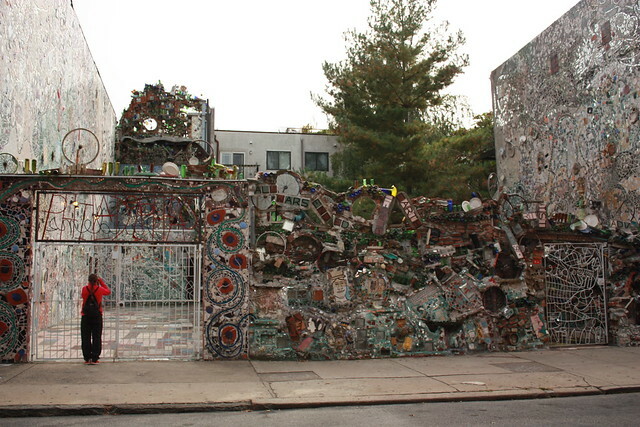 Philadelphia’s Magic Gardens – Almost impossible to describe, but thoroughly engrossing, this mosaicked wonderland is the creation of artist Isaiah Zagar. It’s glittery, bizarre, and quite pointy at parts. Words don’t do it justice, but fortunately I took plenty of photos. (Also, be sure to keep an eye out for Zagar’s mosaicked walls throughout the city – he’s made more than 200 of them). 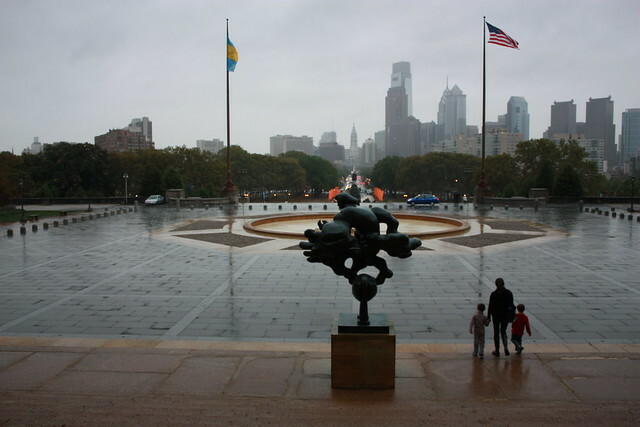 The Rocky Steps – Take a moment to run up the steps of the Philly Art Museum – just like Rocky Balboa did. Is it completely dorky? Yes. But it’s fun, too. And don’t forget to stop at the statue dedicated to the fictional boxer at the base of the steps. Rodin Museum – Not terribly big, but architecturally beautiful and really engrossing – especially if you do the docent tour. Admission is included in your ticket to the Philly Museum of Art (or, if you go to the Rodin first, save your stub and they’ll deduct the price when you get to the PMA). You can walk from one museum to the other, or take the free tram that runs between them. The Italian Market – I kept arriving here – twice, in fact – just as they were shutting down (which happens around 3pm, so get there before then). The vendors mostly sell produce, but the surrounding shops have all manner of Italian delicacies: meats, cheeses, and pastries. It’s not terribly fancy, it reeks of garlic and raw meat, and it feels incredibly, authentically Philly. Closed on Mondays. Oh, and Rocky ran through here as part of his training. 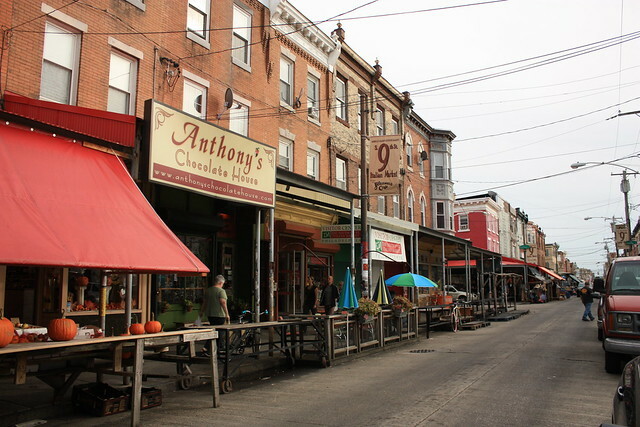 Northern Liberties – During our last visit to Philadelphia, Rand and I stayed in this neighborhood. Locals told us not to venture north of Girard – supposedly it gets a little sketchy up there. But south of it, you’ll find some awesome shops and independent boutiques (my favorites: Art Star, Arcadia Boutique, and SWAG Boutique. The Piazza is home to some cool little shops, too.) Bonus: Brown Betty is located here. 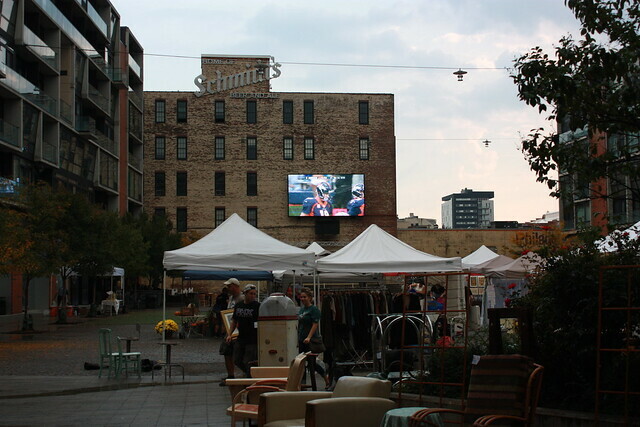 Weekend flea market at the Piazza in Northern Liberties. Old City – I failed to get here during my last trip, something which I intend to rectify as soon as I return to Philly. The city started here; the narrow streets are now lined with galleries, boutiques, and restaurants, housed in old, creeky buildings with slanted floors. Rittenhouse Row and Square – Not only is the eponymous square lovely (full of fun statues, it’s a great place for a walk or, weather permitting, lunch outside), but there’s plenty of boutiques and shops nearby, and some great restaurants to chose from. Plus, you’re in the heart of downtown, and close to Mutter Museum. Give yourself an afternoon to roam around here and enjoy. I can vouch for quite a few of these myself – the rest come highly recommend from my friends (and Philly locals) Wil and Nora, who appreciate food in the same way that I do: they love a well-curated, crafted meal as much as they loves a greasy, thrown-together one. All that matters is that it tastes good, and the servers aren’t dicks. Fortunately, Philadelphia has plenty of spots that fit the bill. Amada – Upscale tapas, including lots of seafood dishes. Never been here myself, but Wil says it’s good, and apparently the entire internet agrees. Bar Ferdinand – Dark, cozy, and fun, this tapas bar has everything from the traditional (tortilla espanola) to the fanciful (machego frito with apple foam and quince puree. 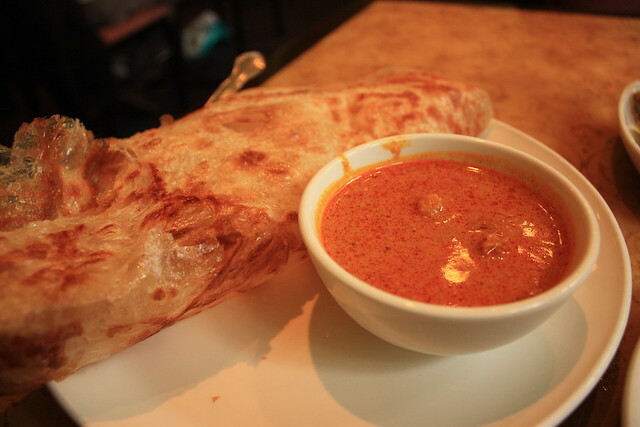 Which, by the way, you should totally order and eat in one glorious bite). Eulogy – This Belgian tavern boasts Philadelphia’s largest beer selection, and the knowledgeable staff can help if you’re overwhelmed by options. They serve both American and Belgian pub fare – lots of sandwiches, burgers, etc., which is supposedly pretty good, too. But it sounds like this place is mostly about the beer. 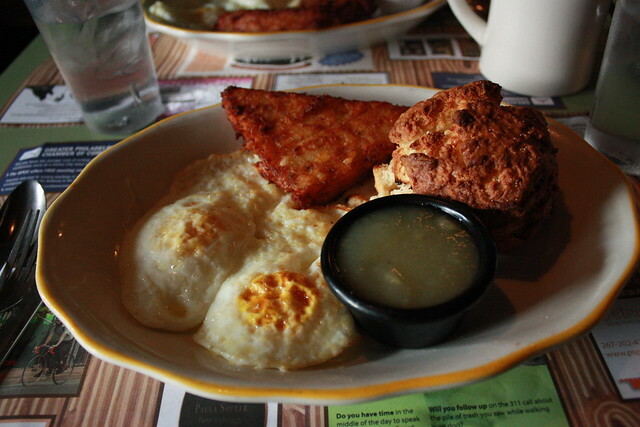 Honey’s Sit-N-Eat – A cozy, no-frills breakfast/lunch diner with ridiculously huge portions and some seriously awesome latkes. Perfect after a rough night. Or, if you’re Rand, several rough nights in a row. Modo Mio – This small Italian restaurant in Northern Liberties is on the fancier side, but prices are still crazy reasonable for what you get. Go for the prix fixe menu turistica, which is a ton of food for a great price. Oyster House – You can get all manner of seafood here, including, of course, oysters. The place manages to feel upscale but not pretentious. I stopped in for a delightful, elegant lunch. 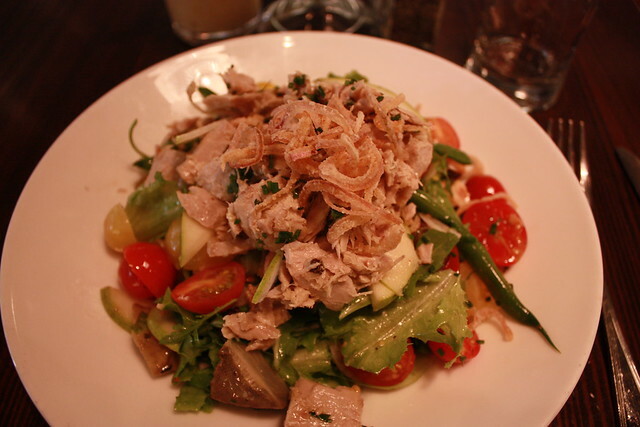 Salad with tuna at Oyster House. Radicchio Cafe – Beautifully composed Italian dishes (seriously, their Yelp photo page looks like something out of Saveur, and it’s just a bunch of camera pics) served in a casual setting. Another one of Wil’s picks. Rangoon – Dark and a little bit of a whole-in-the-wall, this restaurant offers Burmese cuisine, which I found to be a glorious hybrid of Indian, Thai, and Chinese. Prices are super reasonable. Be careful ordering: my meal was delicious, but ended up being entirely fried. Sidecar Bar and Grille – another recommendation from Wil, I’ve never been here myself, but the menu boasts lots of burgers, sandwiches, and salads. Beer selection isn’t terribly big, but supposedly still unimpeachable. Go for happy hour, or a late-night snack. Standard Tap – I’m not a beer drinker, but I married one. As such, he’s a big fan of this place, but I can only speak to the food, which is solid. Mostly fancyish pub fare – big burgers with aged cheeses, chicken pot pie with puff pastry. I wouldn’t head to Northern Liberties just for this place, but if you’re in that part of town, stop here. Villa di Roma – Shockingly unpretentious little hole-in-the-wall serving generous portions of Italian-American food. Not entirely traditional, especially for someone like me, who grew up with tripe-and-pig’s-feet-Italian cuisine (you won’t find anything close to that adventurous here. Think spaghetti and meatballs, linguine with clams, and lasagna covered in melted cheese). We were a bit skeptical when we walked in, but both Rand and I cleaned our huge plates. Looking for cheesesteak? Wil’s favorites are Jim’s and Ishkabibble’s (the latter of which might be the best name, ever). 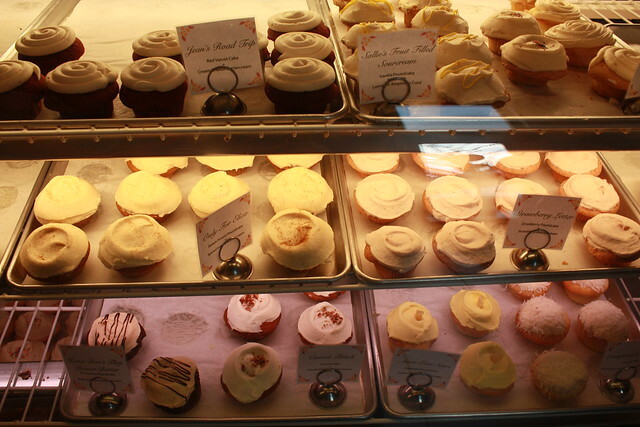 Brown Betty’s – These are seriously some of the best cupcakes I’ve ever had. I don’t say that lightly. Rand thinks the chocolate ones are a little too dense (like a poundcake), but all the vanilla variants are just lovely. The offerings at Brown Betty. Isgro Pasticceria – I missed out on this place, and I just want to curl up in a ball and cry about it. An Italian bakery with all sorts of cakes, cookies, and cannolis. More Than Just Ice Cream – Never been here myself, but Wil recommended this place. Roughly a third of the menu is dedicated to sweets, with good reason: that’s their forte. I wouldn’t get dinner here, but it seems like a good place for dessert. I can’t vouch for most of these firsthand, since we rarely stay in hotels in Philly (we either drive in from Jersey for the day, or we stay with our friends Wil and Nora, and they’ve informed me that they won’t extend that same offer to my readers. Sorry). But I’ve heard good things about all of these spots. Le Meridien – Rand and I stayed here with his grandparents – there were few complaints from any of us. This modern hotel is centrally located, but it’s not the best place to walk around (it feels a little commercial). Rooms were spacious and clean. The downstairs bar/lobby feels a little bit dark and nightclubby; not our thing, but not a big deal, either. Hotel Monaco – this boutique hotel just opened up in Philly; I haven’t been here, but I’ve stayed in several Monacos/Kimpton-run hotels in California, Oregon, and New York, and been very happy with them. Looks like the Philly outpost has the same awesome decor and hosted wine hour. This one’s on Chesnut Street, close to Independence Hall and the Liberty Bell. Palomar Hotel – another Kimpton-run boutique hotel (see above), conveniently located near Rittenhouse Square, and within walking distance of all kinds of awesome. The Four Seasons – Super fancy pants and utterly gorgeous. I can’t afford to stay here. If you can, then you probably don’t need to be told that is an awesome, if slightly uninspired, choice. (Though the location isn’t as central as the Kimptons).